Cresset Discovery Services (CDS) worked with BioBlocks to build a fragment library with maximum coverage of 3D chemical space. As part of the project, we developed an innovative clustering method that made it possible to assess the 3D similarity across their virtual database of over 1.5 million fragments. The goal of the project was to help BioBlocks build the maximum 3D diversity into small libraries of fragments from a starting pool of over a million compounds. Existing techniques would have required an unfeasible amount of computing power so CDS developed an entirely novel rapid clustering method especially for the project. The solution was still extremely computationally challenging, but we were able to use our expertise in distributing calculations to the cloud to deliver the results that BioBlocks needed on time and within budget. said Warren Wade, VP of Chemistry at BioBlocks. “Because our fragments are designed to be new chemical matter, they challenged the limits of existing structural descriptions. Cresset worked closely with us to overcome these limits and produce a high value compound set”. 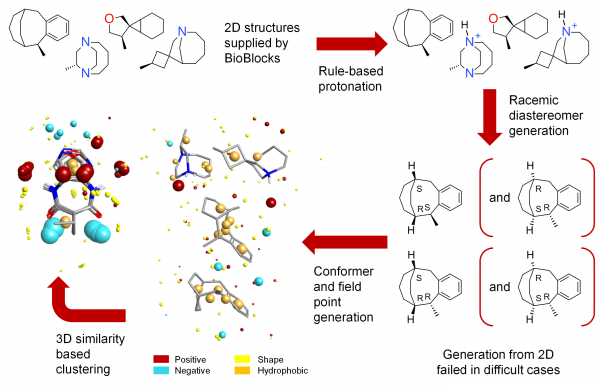 The final result was a 3D fragment library that contains a significant number of compounds with novel core structures that are now viable targets for fragment generation. BioBlocks envisions this comprehensive fragment library to be a drug discovery tool available only to collaborators who will be able to leverage this new chemical space for their lead discovery programs and utilize BioBlocks’ collaborative medicinal chemistry processes that were developed to increase the probability of generating commercially viable leads. Read more about the large scale compound clustering in 3D project. Contact Cressset Discovery Services to find out more about how we can help you design large scale libraries for your project.